At the end of the summer term, we were sad to say goodbye to our PM, Andrea Kempson, who worked so hard to build the project to where it is today. Thank you, Andrea and good luck with all your new ventures. But everyone at Soundmix is excited to welcome Sasha Leacock, our new Project Manager. 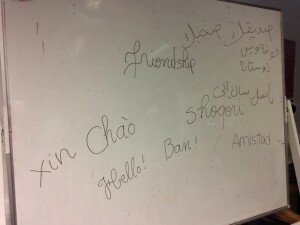 Sasha hit the ground running at the start of the new term in September and quickly got to know the tutor team and the Refugee Council staff as well as the young people at the weekly sessions. We look forward to her taking Soundmix into the future, now with the generous support of Children in Need. Read more about Sasha in Meet the team. Big thanks to Children in Need! At Soundmix, the young people we work with have the opportunity to not only learn musical skills but also to broaden their experience of musical engagement in all its forms. An important part of this is songwriting. Each term, our young people collaborate to write a song, which they will perform as a group once complete. The songwriting exercise not only gets the creative juices flowing, it also helps achieve our broader aims for the sessions: to increase confidence, maintain opportunities for interaction, and reduce social isolation. For our most recent songwriting exercise, we started with the theme of friendship. Here’s the word “Friendship” translated into 5 different languages: Arabic, Vietnamese, Spanish, Albanian and Farsi. Happy new year from Soundmix! From all at Soundmix we would like to wish all our supporters a very happy 2017! Thank you to everyone who helped make so much of our progress possible in 2016. Thank you to our fantastic programme manager, volunteers, trustees, and partner organisations, who continue to allow Soundmix to impact positively on the lives of so many young refugees. We look forward to continuing this powerful work in 2018! In July we were fortunate enough to be able to take 11 young people from our Soundmix group to watch Beyoncé live in concert at Wembley Stadium. This was an incredible experience for the whole group. We had extraordinary VIP access; as a result our group were lucky enough to get very close to the front without many crowds. At the end of May we took our group to the Quadrangle in Shoreham, Kent, for a 3 day residential in partnership with Refugee Youth. The residential was an opportunity for our group to take part in outdoor activities and games, cook their meals together, and of course musical activities. The group both learned new songs and wrote one of their own. On our final evening we celebrated with a large bonfire, singing songs and playing music together. Some of the group even sang solos or duets. In June the group were invited to perform as part of the Midsummer Festival, back at the Quadrangle in Kent. Our group had the opportunity to engage in a variety of ways, helping with the set up of the festival, taking part in an informal busking set, and putting on a bigger performance of their 3 songs. After a group performance, two of our group took the leap of giving solo performances. This was a really exciting and memorable moment for the entire group! The festival organisers were very happy with the performance given by the Soundmix group – we hope to return next year! Part of our mission at Soundmix is to develop young people’s engagement with music in all forms. As well as developing young people’s musical skills and first hand experience of musical instruments, we give opportunities for them to explore live music and see a variety of live performances. In May we took 9 young people from our Soundmix session at the Refugee Council, Croydon, to a live concert at the Roundhouse, Camden. Since opening as a performing arts venue in 1964, the Roundhouse has established itself as a key feature of the live music scene in London. This trip aimed to help our young people experience the face of live music in our capital. The concert, featuring Songhoy Blues, United Vibrations and Fatoumata Diawara, was the first time any of our group had attended a large concert of this sort- and they greatly enjoyed themselves! After their performance, United Vibrations came to meet our young people and spoke to them about the instruments they have had a chance to play as part of their Soundmix. The group even earned an invite to visit the group’s studios in Deptford to make a track! 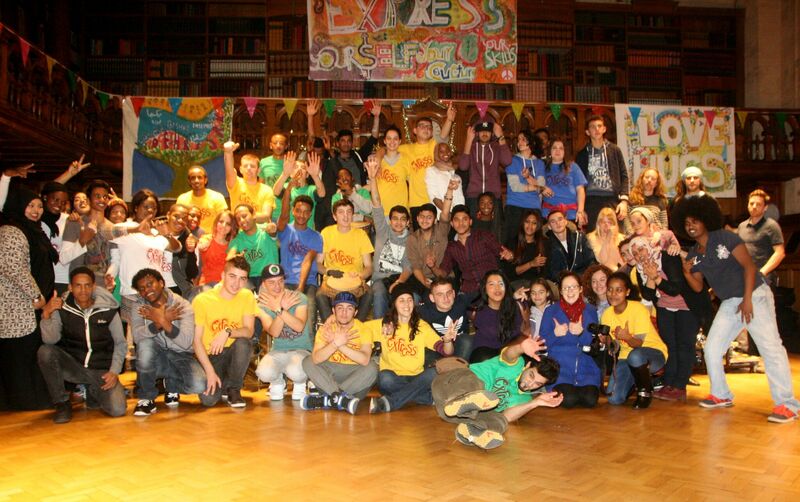 Soundmix is proud to be supported by Children in Need. Children in Need is the BBC’s UK charity. Since 1980 it has raised over £600 million to change the lives of disabled children and young people in the UK. Support from Children in Need allows Soundmix to provide equipment, tutors, and trips to the young people who attend our weekly music session at Croydon College. Here’s a mural made by our music group to say a big Thank You to Children in Need. Soundmix is proud to be supported by Youth Music. Youth Music support a range of projects that help young people access life changing opportunities through musical engagement. Youth Music have recently published a new video which documents the impact the projects they fund can have on young people’s lives. At Soundmix we are committed to mirroring this work by helping to increase the skills and decrease the isolation experienced by young unaccompanied refugees and asylum seekers. Save the date for our not-to-be-missed Soundmix annual fundraiser Quiz! Quizmaster Josh Cohen will challenge us with his wide range of questions including a musical round starring Soundmix Project Manager, Andrea. Come with a team or join a team when you arrive. The atmosphere is cut-throat but extremely informal. Everyone very welcome!